Belarus State TV reporters are preoccupied with the removal of communist-era monuments throughout Ukraine - over 50 Lenins have been recently been torn down. Belarus State TV reporters are preoccupied with the removal of communist-era monuments throughout Ukraine – over 50 Lenins have been recently been torn down. Alexander Lukashenka has named the reasons for the upheavals taking place throughout Ukraine: the nation's economic collapse and the corrupt conduct of its authorities. Recently, Belarusian state TV reported on decreasing levels of corruption in Belarus, which, in their view, proves that there are none of the necessary preconditions for a similar revolutionary scenario in the country. Belaruskali is back on the global market. State TV reported that they were hopeful that this time around the Belarusian company would not create a new potash cartel with the Russians. Harsh reforms in Ukraine to overcome economic difficulties. While their Western partners promised to provide loans to the country, Kiev will still have to pay them back at some point. The new government has already prepared a package of unpopular reforms to save the state budget and meet the conditions for the loans that the West asked of them. The EU leadership discusses Russia and Ukraine. The leaders of EU member countries gathered in Brussels to discuss the events unfolding in Ukraine. They are considering imposing sanctions on Russia. “Even before the summit began, observers noted there was unanimity between them,” one state TV journalist pointed out. One reporter provided commentary on some bit of news that sent ripples throughout Internet – the content of the leaked phone call between the Estonian Minister for Foreign Affairs, Urmas Paet, and Catherine Ashton. According to this conversation, the snipers who were firing at the activists on Maidan were both supporters and opponents of the opposition. ‘Leninopady’. Why are Ukrainians tearing down communist-era monuments? Over the last four months Ukrainians have removed more than 50 monuments commemorating the nation's Soviet past. Ukrainians have taken down a large number Lenin monuments in the central part of the country and in a few of its eastern regions. The north-eastern region and Crimea were able to avoid what has been deemed in the media “leninopad” (literally “Lenin falling”). In the western regions of Ukraine, people have removed these and other Soviet monuments long ago, a process that began in the early 1990s. Recently, Ukrainians in the nation's western regions removal of monuments was confined only to Russian Genernal Kutuzov monuments. “Now Kiev has decided to embark on the path of European integration. In liberal Europe, it is not customary to destroy monuments,” one reporter explains. Even in the Baltic countries, which do not celebrate the Soviet period of their own history, they have protected these soviet-era monuments in special parks set aside for their preservation. In the rest of Europe, various monuments stand regardless of the political views of the country’s leadership, he concludes. Minsk’ position on Crimea remains the same – Lukashenka reaffirmed Belarus' position during the State Security Council's latest session. The Belarusian ruler emphasised the traditionally positive economic ties between Belarus and Ukraine. “There are politicians who have decided to the solve problems of their people. We will not interfere in this [process],” he said. He also offered his own help help achieve stability in Ukraine. Lukashenka is not afraid of a Maidan-like scenario in Belarus. “There will be no Maidan in Minsk. There is no place for a Maidan here,” he said. In his opinion, “there are conceptual reasons for similar revolutions,” to happen elsewhere. Lukashenka pointed out a few times that the collapse of the Ukrainian economy and corruption had led Ukraine to overthrow its (now -ex) government officials. The head of state also commented on the fact that the Western press was regularly covering him to see what his reaction would be. “The EU is threatening me all the time,” he stated. In his words, nobody has put any pressure on him with regard to the current Ukrainian conflict. “We are one nation with the Russians. As well as the Ukrainians. We are Slavs and we will be together forever,” Lukashenka said. Threat coming from NATO, not from Russia. In its coverage, state TV has given the impression that it was the West which had intensified the Ukrainian conflict. According to one reporter, "the rising level of NATO's participation was the cause of the events that are currently taking place in Ukraine." Lukashenka noted that all of Belarus' neighbours, including Poland and the Baltic States, recently carried out military exercises. Similar actions had also taken place in the Black Sea. “They say that these exercises had been planned in advanced,” stated one journalist, with a tone of scepticism. The presence of NATO is unsettling to the Belarusian leadership. “What should we do? Should we just watch it go on?”, Lukashenka said and called for an appropriate response from both Belarus and its ally, Russia. Belaruskali will not revive a joint venture with Uralkali. With the advent of several recent contracts of Belaruskali being successfully concluded in China and Indonesia, it has once again attracted the attention of Russian companies. “Will Minsk, having learned a bitter lesson last year, move towards a new alliance?”, prompts one journalist. In his opinion, the new owners of Uralkali will return and will once more try to invite Minsk to create a potash cartel with them. According to state TV, the Russians have already changed their tone a few times when commenting on the Belarusian Potash Company in the media in the past months. “In Autumn they said – the Belarusians will not be able to sell potash without us. In Winter – BPC established its own foothold in China and signed a unique contract in Indonesia,” they noted, when reporting on Russian media coverage of Belarus' success. “We will not establish any joint companies in Moscow. If anywhere, if a similar company was created, it would be in Minsk,” Lukashenka stated during a meeting with Belarusian officials. Belarus' national interests should be considered to be of primary importance, the journalist emphasised. 79% of Belarusians trust Alexander Lukashenka. During a regular evening broadcast programme, information on the results of a societal survey conducted in Belarus were presented. The programme did not state who conducted the survey. According to the survey, the vast majority of Belarusians, 74%, are happy with their life. 31% of respondents think that their financial situation had improved over the last three months. Fewer people, around 22%, stated that it had deteriorated. The state TV reporter emphasised that 81% of Belarusians saw the social – political situation of Belarus as being stable. Only 2% of them stated that would participate in protests if they were ever to take place. Significantly fewer people (40%) trust the government and parliament. According to state TV, an increase in salaries was one of the main reasons for the positive attitudes of Belarusians. Lukashenka, Putin and Nazarbayev discuss the Eurasian project. Lukashenka noted that the countries should remove all barriers that are keeping the countries from establishing a common market. The heads of the state also discussed Armenia's potential membership. According to Putin, it is long overdue and they should begin to prepare an agreement with Armenia right away. One state TV journalist stated that on the same day of the Eurasian project meeting, Belarusian Prime Minister Mikhail Miasnikovich criticised his own ministers for delays that have continued to obstruct Belarus' ability to conclude the final steps necessary to integrate into the economic union. The state is successful in combating corruption. State TV reports that that over the last three years the number of offences related to corruption has seen a significant decline. Corruption is most prevalent in the educational, industrial and health care sectors. “Corruption and economic offences pose the biggest threat to the country,” Lukashenka stated during a meeting with officials. He stressed how much the authorities have done to combat the problem. State TV commented that according to [unnamed – BD] experts, that thanks to the ongoing “daily battle” with corruption, there are no economic, social and political preconditions that would allow corruption to flourish in Belarus. On 10 March the EU Delegation to Belarus organised a conference entitled 'EU-Belarus Sectoral Cooperation: Looking Back and Looking Forward' in Minsk. Belarusian and European diplomats in attendance agreed that the crisis in Ukraine would not affect EU-Belarus relations as they are setting a new agenda for their bilateral relations. Another rapprochement between Belarus and the European Union seems to be looming large. The upcoming presidential campaign in Belarus, in part, explains the positive tone of the Belarusian MFA. The Kremlin's pressure on its neighbours also has set the stage for the authorities in Minsk to become more cooperative with the EU. The conference, which took place on 10 March, was marked by a decidedly different tone when compared with the previous rhetoric the authorities had been employing with regards to EU-Belarus relations. For nearly two years, in the aftermath of the crackdown on 19 December 2010, both sides have resorted mainly to mutual accusations and ultimatums. At the end of 2012, after Uladzimir Makey became foreign minister, Belarus started to soften its tone. And now an air of positivity has already begun to dominate the speeches of both Belarusian and EU officials. At the conference, the EU Delegation highlighted the major achievements in their cooperation over the past seven years. The EU granted Belarus about €200 million in technical assistance in 2007-2013. One example of success that was presented was the EU donating €913,000 worth of equipment to Belarus’ State Customs Committee. The aid also helped to build a biogas plant at a dairy farm in the Minsk region. Additionally, almost 80 Belarusian students received full scholarships to study for undergraduate and graduate degrees at universities across the EU. Maira Mora, head of the EU Delegation in Minsk, did emphasise during the conference the standing problem of political prisoners. However, she seemed quite optimistic about the future. Among other things, she presumed that the latest events in Ukraine would not discourage Belarus from developing its cooperation with the EU. Dzianis Sidarenka, who heads the Directorate of General European Cooperation at the Belarusian MFA, generally concurred with Ambassador Mora. He acknowledged that the current state of relations is far below its potential, not in the least because of a lack of bilateral agreements. Sidarenka reminded those in attendance that the Partnership and Cooperation Agreement, which was signed in 1996, never came into effect, as the EU failed to ratify it. Sidarenka also emphasised that the Vilnius Summit of November 2013 opened up new opportunities for future Belarus-EU relations. In particular, he was speaking about the visa initiative that Uladzimir Makey came up with at the summit. Namely, his offer was to begin negotiations on visa liberalisation with the EU. The offer was welcomed with a good degree of optimism from the EU side, as European diplomats had been willing to start visa talks since the beginning of 2011. Many commentators also saw Belarus’ initiative as a small victory for the otherwise failing Eastern Partnership project. Two months later the parties started taking some practical steps in the direction of visa liberalisation. On 29-30 January Deputy Foreign Minister Alena Kupchyna paid a visit to Brussels where the government of Belarus and the European Commission officially launched negotiations over visa liberalisation and readmission. The level of determination on the part of the Belarusian authorities in these negotiations, however, remains unclear. So far they have demonstrated their readiness to have the agreements prepared for signing at the Riga Eastern Partnership Summit in the first half of 2015. Effectively, this means that the negotiations need to press forward quickly and finish before the end of 2014. At best, it will then take several months for the EU 28 member states to shuffle the text of the agreements through the process of internal consultations before signing them. EU-Belarus relations are finally getting a new constructive agenda. The Belarusian MFA made a clever move when suggesting visa talks at the Vilnius Summit. The issue interests several stakeholders (EU, Belarusian business and civil society) and does not bear immediate political risks for the authorities in Minsk. It will also look good for Alexander Lukashenka’s presidential campaign in 2015. Moreover, the current EU-Belarus agenda looks likely to go beyond visa regime negotiations. 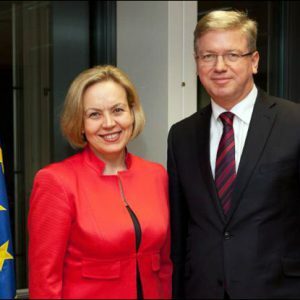 During her Brussels visit Alena Kupchina also held a meeting with Commissioner Stefan Fule and Gunnar Wiegand of the European External Action Service (EEAS). They agreed to start talks on general modernization issues. The declared aim of these talks is to identify an optimal format for future cooperation between the EU and Belarus’ government. Later, another representative of the EEAS Dirk Schuebel stated in a media interview that the EU and Belarus were negotiating a so-called Interim Stage of Cooperation. Its details have yet to be revealed. Schuebel only said that initially in the Interim Stage both parties would focus on the issues of trade and investment. Thus, it looks like European diplomats are trying to get the Belarusian authorities involved in the European Dialogue on Modernisation, albeit in a slightly different format. Rapprochement between the two parties is not, however, occurring without its own set of difficulties. The level of mutual trust remains low. But Belarus' government seems genuinely determined to improve ties with the EU. The last year and a half saw a significant increase in the number of working contacts between Belarusian and European diplomats in Minsk and various EU capitals. And this trend is continuously growing. Foreign Minister Makey and his deputies are becoming regular visitors to the EU. For example, Makey recently paid a visit to Latvia and Lithuania. The reasons for intensifying diplomatic activity appear to be twofold. First is the so-called logic of electoral cycles. To put it simply, the closer Belarus gets to another presidential campaign the more motivated the government becomes to improve its relations with the West. And as elections conclude, this motivation subsides. In a nutshell, the authorities simply strive to minimise risks during the challenging environment which develops around presidential elections. And they perceive deteriorating relations with the West as one such risk. Similar developments have occurred in the lead up to a presidential campaign in the past. However, at that time the authorities initiated rapprochement earlier: more than two years before polling day. And the presidential campaign itself became its culmination. Second, rapprochement represents the logic of a foreign policy balancing act between Russia and the EU. The longer relations with the EU remain broken, the more difficult it becomes to withstand Russian economic and political pressure. Belarusian diplomats used this exact wording in negotiations with the EU in 2008-2010. Very likely, similar words are have come up in their current closed meetings. Thus, despite the notable Ukrainian factor, rapprochement between Belarus and the EU will, in all probability, progress at least until the 2015 presidential elections. With this in mind, there is a chance that the Belarusian authorities will release the remaining political prisoners before voters cast their ballots in 2015 or even before the inaugural face-off at the ice-hockey World Cup in Minsk in May 2014.